The Weber One Touch Charcoal Grill is perfect for those of you who enjoy a simple backyard charcoal fired barbeque, but who also don’t need an elaborate, say, $1,500 to $2,000 grill. This grill is a great choice that lands somewhere between high-powered outdoor gourmet cooking –and an easy-going cook-out of some steaks, burgers, kebabs or corn cobs. That’s not to say you’ll necessarily be limited to just basic grilling with the Weber One-Touch Gold. It’s no more grill than you need, and so you don’t pay for more than you want. However, the large cooking area still allows you to get creative with your backyard culinary creations. One gets the feeling they’re getting a little more for their money for a grill of this price range. But what really made this product stand out for us are some clever and convenient functional design extras, which have also drawn some rave reviews from other users – and we’re going to tell you about those cool extras just a bit later in this review. Of course, the One-Touch Gold is a Weber product, a company legendary for its superior customer service and support, as well as an almost obsessive commitment to quality. Indeed, the Weber philosophy is demonstrated in the design of this basic and affordable grill. The bottom line is that it will do exactly what you want it to do – cook up sizzling, mouth-watering steaks, juicy burgers, savory brats or even roast a bird to succulent perfection. The Weber One-Touch Gold is constructed from high-grade steel enameled with porcelain. Porcelain is among the most durable and weather-resistant substances known to man. This grill is designed to handle all weather conditions. It would take years to show signs of rust and wear, even if left outside and uncovered. Although a cover is never a bad idea, unless you keep inside a garage or shed – view the One-Touch cover hear. Weber engineers bake on the porcelain enamel at 1,500 degrees Fahrenheit, meaning the frequent use of high heat charcoal will never eat through the lower bowl or lid, and never peel or flake the finish. The porcelain-on-steel construction also allows heat to radiate evenly throughout the cooking area, giving you the best chance to get your food cooked to perfection, without a lot of turning or repositioning. The expansive 22.5-inch cooking area will accommodate six large steaks, or twice as many burger patties. You can also easily fit a good sized chicken or a decent-sized turkey on the surface and have room to cover it with a lid and brazing a dozen kebobs at once is easily possible with this grill. Needless to say, you’ll have room or can make room for corn on the cob, potatoes, and vegetables while you also grill meat. Speaking of the grill itself, it’s nickel-plated, which helps keep food-stickage problems to an absolute minimum. The grills are easy to clean with a brass-wire brush or can be removed and cleaned with warm water. Nickel-plated steel is highly resistant to rust and wear, giving these grates many years of maintenance free use. They’ll endure a rigorous scrubbing, so you can avoid health issues from leftover food or grease, or damaging your grill with an extra thorough cleaning. The grill also has two hinged side openings – this makes it super easy and convenient to add more charcoal briquettes while you are cooking. When the lid is not is use, it can hang from a side hook – again, highly convenient because you don’t have to set the lid down somewhere else, such as on the ground or some other surface. The whole unit functions together as a singular unit. The Weber One-Touch Gold is configured with aluminum vents which absolutely will not rust – ever – and which have smooth movement for opening and closing so you can control heat levels with ease. Now, this is a classic tripod-base design, but it proves to be extremely study and stable, unlike some cheaper, generic tripod grills. Weber engineers have given the aluminum legs of this product just the right expanse to make it stay in place in rock solid fashion with no shaking while you’re cooking. Because it is a tripod, it’s easy to simply tilt up the unit and wheel around for easy movement. The wheels themselves are all-weather and solid. They won’t jam up or fall off. Some have voiced the mild complaint that the wheels are plastic, rather than rubber, but they still roll along nicely and allow for easy maneuvering of your grill should you need to. The Weber One-Touch Gold also sports an ingeniously-designed ash catcher made of aluminum, and even though it is handling hot ash deposits, users report that this ash bin is remarkably resistant to wear, damage — and simply will not rust! The ash catcher brings us to some of the other handy extras of the One-Touch that make this a nifty little grill that’s a pleasure to use. The “One-Touch” refers to the simple cleaning system. You know what it’s like with most basic grills of similar design – getting rid of the old ashes is a hassle. Sometimes you have to knock on the vent with a trawl or other tool. You get ash on your clothing, maybe even a little dust flying into your face. The Weber One-Touch system eliminates all that. All you do is manipulate a lever system which sifts ashes with a set of dull blades. The ashes fall down and out into the ash catcher. All that’s left is to remove the ash-catcher and dump. You won’t even get your hands dirty, unless you really try to! The One-Touch ash removal system eliminates one of the small annoyances of grilling with charcoal. The ash catcher is certainly a thoughtful and handy design feature, solves a huge clean-up problem and simply puts this grill into a class of its own. You’ll also appreciate the handles – again, maybe a small thing – but attention to detail goes a long way with any product. The handles are glass-enforced nylon. The fact is, you’ll be using the handles a lot to move the grill or take the lid on an off. You won’t need gloves because nylon stays conveniently cool to the touch. They’re strong and not likely to break for any reason. We already mentioned them briefly, but it’s worth mentioning again some of these extra design touches: the hinged grill grates come in handier than you might expect, the convenient lid hanger is a small joy, and the solid feel of this unit never makes you think the grill is going shake apart as you move it around – or transport it to a park or parking lot for some tailgating! 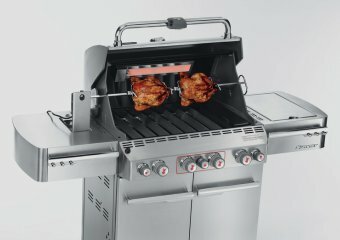 How does it stack up against similar grill models? As you might guess, the Weber One-Touch Gold is similar to its sister unit, the One-Touch Gold 18.5-inch. How significant is the size difference? Well, in terms of pure numbers, what we have is a larger grill with a total of 363 square inches of cooking space compared to 240 square inches for the smaller model. Does it make that much difference? The reality is that the seemingly small difference is quite significant. The One-Touch Gold 22.5, in effect, has 75% more total cooking space. That means you can get a much bigger bird to enclose completely in the larger unit, in addition to a few more steaks and burgers on the surface, longer kebobs, etc. Is that the worth the price difference of about $20 or $30? We think most people will conclude that having the greater cooking surface area and overall volume is well worth the price. However, much depends on the individual needs of the griller. Consider this: You may be in a situation in which you have less room. For example, perhaps you live in an apartment with only a small outdoor balcony to work with. In this case, you may appreciate the slightly more compact size of the Weber One-Touch Gold 18.5. This also makes it easier to transport – another important aspect to consider. At 26 pounds, the 18.5-inch model is about 10 pounds less to lift than the 22.5 incher. It stands just over 20 inches high and is 14.6 inches wide. The larger unit stands 24 inches high and is almost 15 inches wide. Both grills bear the same high build quality, sturdy construction, the convenient ash-removal system and all the rest. It’s basically the same grill, just smaller. One more thing: You can only get the smaller unit in black, whereas the Weber One-Touch Gold 22.5-inch model comes in green, dark blue and black. Note: Neither of these grills has a thermometer as does the Weber One-Touch Gold 26.75-inch model. For some, this is a rather serious drawback to both the 18.5 and the 22.5 – to most, however, a thermometer on an outdoor grill is unnecessary. Also, the lack of thermometer can be remedied by using a hand-held or stand-alone thermometer which you can purchase in any hardware store. Don’t ever use charcoal fuel lighter again. It’s dangerous and can add a petroleum taint to the food. Consider the Weber Rapidfire Chimney starter to get your coals going fuel free, more safely and just as fast. You will definitely not regret switching to the chimney starter method. You’ll never need to buy fuel again. It will pay for itself easily in saved lighter-fluid cost. The One-Touch Gold is one of the most weather-resistant grills we’ve ever reviewed. And even though it is a fairly low-cost product, you still may want to protect this gem with a Premium Kettle Cover designed specifically to fit this grill. Once you use the optional work table with the Weber One-Touch, you’ll wonder how you ever got along without it. 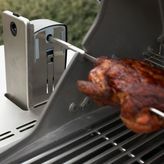 It just makes it super convenient to set down tools, spices, plates which you are using to do your grilling. Weber makes a 22.5-inch rotisserie device designed to fit and work with the One-Touch beautifully. 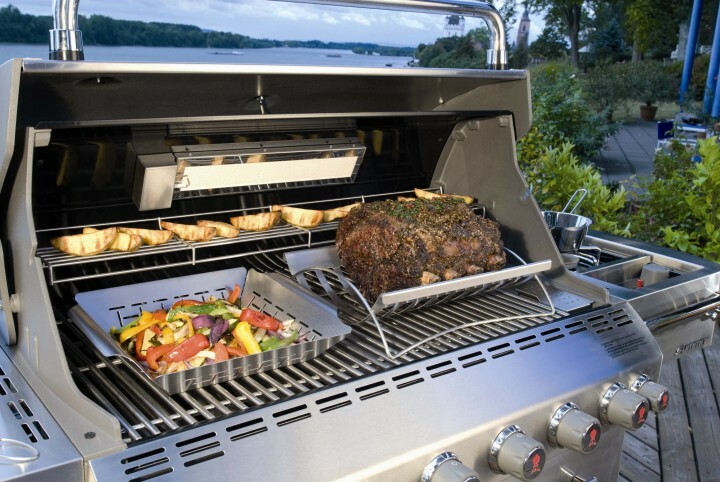 Many users report adding the rotisserie makes this grill “twice the grill” – they love it that much. It is an optional extra but definitely give the rotisserie strong consideration and purchase at the same time as the grill. An extensive and objective review of nearly 300 online reviews of the Weber One-Touch Gold reveals the highest 5-star rating among some 95% of all reviewers. The most frequent comments of highest satisfaction revolve around the solid, quality feel of the product, but the super-easy ash removal system gets a lot of mentions and rave reviews. Just about all agree that food cooks evenly, steaks and burgers don’t dry out, and birds and kebobs get cooked evenly and to perfection. Most said assembly was super easy – about 15 to 20 minutes even for the mechanically challenged. It’s fairly light weight at just less than 36 pounds. 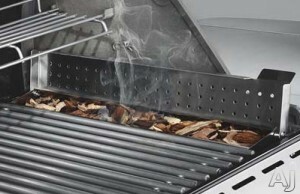 Most of the complaints surround ancillary aspects associated with the grill, such as parts missing when receiving the product after being shipped. Some complained of dented kettles or chipping/flaking on the finish –although Weber generally will agree to replace any flawed or missing part under its service/warranty plan. By the way, this product comes with a 10-year limited warranty. The Weber One-Touch Gold is your basic, simple, All-American backyard barbecue kettle grill. It may look more or less the same as generic brands that sell for a fraction of the cost in major retail stores, but the average price of around $150 is easily well worth the superior construction quality you get, the rock-solid stable design, the high-quality nickel-plated grills and the truly helpful extras — especially the easy ash removal — that round out this product. This is a basic but affordable barbeque and sure to give you years of simple fun and effective back yard charcoal cooking. The Weber Summit S-470 is an object of stainless steel beauty, but even better, those who have purchased this gleaming grill report that it has lifted their outdoor cookout experience to a new level. When reviewing any product, one has to be on guard to avoid hyperbole and stick to the objective facts. Certainly, we’re going to lay out all the hard facts and data here – but based on a sober, objective analysis of direct experience by actual users of this product, it seems that Weber has hit it out of the park with the Summit S-470. It’s important to note that no one sells more grills than Weber. This company has succeeded by adopting a relentless devotion to high quality products backed up by superior customer service. Thus, even before you purchase a Weber product, you can be confident you’re dealing with a solid company that won’t ignore you as soon as they have your money. That’s backed up with an iron-clad 25 year warranty, and a time-limited offer to replace many – but not all — parts for free. The first thing we noticed when handling this grill is that the Weber S-470 has an incredibly solid feel. The frames are heavily welded. The design engineers seemed to have included as many welds as possible in favor of the various fasteners many other lesser grill designs favor. There are some fasteners on this model, but the high-welding ratio really gives this piece of cooking equipment a solid and stable feel. You’re going to need this for those large lunch or dinner parties as you don’t want your grill wobbling and shaking as some makes and models of a lesser build quality are susceptible too. Now let’s take a brief look at some of the features of the grill before we discuss how the Weber S-470 will make your grilling experience as good as it can be. most other grills in its price range! The S470’s not only made well but it also looks great! 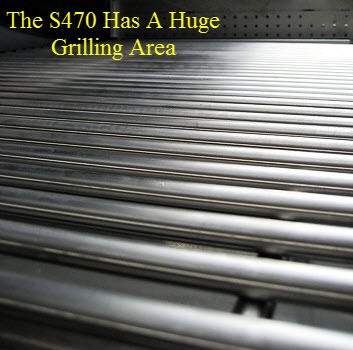 The majority of the S-470 is constructed of high-grade stainless steel. A few years ago Weber switched from grade 304 stainless steel to 420. Believe us when we say this is a good thing. You’ll pay a little extra for the higher grade steel but it means this grill will outlast most on the market giving you more bang for your buck in the long run. Even with this improvement, some people who live in high-humidity environments can find that even 420 steel tends to suffer a bit from the effects of heavy, persistent moisture, resulting in some parts needing to be replaced. For most users, however, it takes years before any natural wear in the stainless steel surface begins to show. Covering this grill in a properly fitted Weber grill cover can alleviate this concern and fully protect your grill. The real secret to amazing steaks…ones your friends will be jealous of and wish they could cook-up is all down to the quality of the grill grate! The grilling grates are stainless steel as well, made from 9.5 mm (3/8-inch) rods. That’s thicker than probably any other grill on the market. Thickness is important in how your food cooks. In short, the thicker the rods, the better the heat transfer to items like steaks, making for excellent and even cooking. Trust on this…If you want great steaks…The sort of steaks that’ll make your friends and family jealous, then you want to get a grill with these rods! The first thing we noticed about the S470’s cooking surface is there is certainly a lot of it! The S-470 features four main burners (with an option for six), but also a sear burner, an IR (infrared) burner and a smoker burner. The total cooking area is 580 square inches – which is a lot! 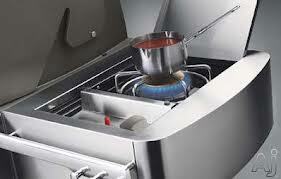 If you include the 130 square inch warming rack, you have a 638 square-inch total cooking area. Remember that the infrared feature allows you to cook rotisserie style, and the rotisserie is built in. Also, the rotisserie conveniently tucks away when not in use, giving you extra clear cooking space when you’re not using this feature. That, along with the smoker, gives you the options for a huge variety of cooking styles. Weber engineers seem especially proud of this grill’s “Sear Station” feature to the point they obtained a patent on this design. The Sear Station allows you to step up the heat “on demand” to get just the char or scald you want on a fine cut of meat. It’s pretty incredible. The Weber Summit S-470 delivers easily controlled high intensity heat – for fantastic grilling results! The S-470 delivers 70,000 BTUs under the hood. If you can’t quite grasp BTUs, the under-the-hood temperature capability is 800 degrees Fahrenheit. (It might have to be a hot day outside for it to get exactly that high, however). Why is a very high level of heat important? The reason is that studies have shown that what actually gives grilled food its distinctive taste is not the necessarily the kind of heat – be it charcoal or gas – but the intensity of the heat. It’s high heat which delivers that particular cooked-outdoors flavor. The S470 Can Cook Pretty Much Anything! ts the entire interior, making it a challenge to clean afterword, although that’s simply the nature of cooking with this method. It’s not impossible to clean, mind you, but it just takes some elbow grease to fully clean up after a lengthy smoking session. The great news is that the S-470 can handle pretty much all cooking styles and can cook a huge range of different foods from the simple to extremely complex: Steaks, kabobs, burgers, brats, whole chickens or turkeys, game hens, briquette, leg-of-lamb, fish, steaming clams, grilling shrimp or lobster – all cuts of meat, from the simplest burgers to exotic cuts, are handled with extreme ease. Again, just about all users report a remarkable evenness in doneness is delivered to all meats. As for nonmeat products, again, the S-470 scores well here. Fresh corn on the cob, eggplant, vegetable skewers, mushrooms, baked potatoes – because of the array of cooking styles, this grill can handle just about any kind of vegetable using a cooking method of your choice. 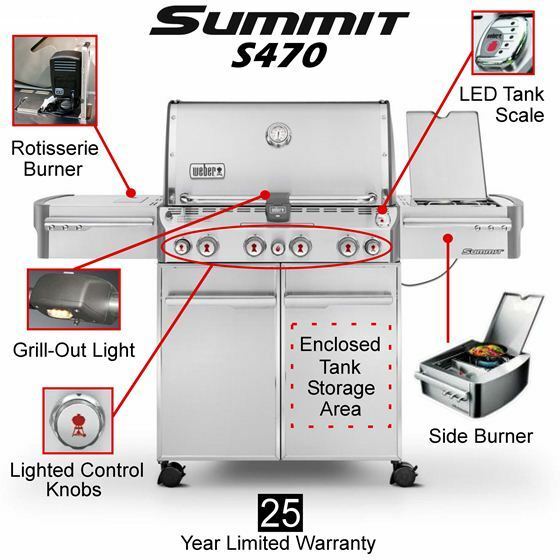 It’s also interesting to note that Summit S-470 can handle items that are not normally associated with outdoor grilling, such as baking a pizza or even bread. The oven-like space and super high heat enables you to handle these items the way they should be handled. The best pizza shops in New York or Chicago, for example, favor high heat of 500 to 700 degrees to get that distinctive old-world pizza quality taste. This grill can actually deliver this for pizza, pitas, calzones, and more. Of course, all grills need to be cleaned, and cleaned well, not just for safe and healthy cooking, but also to preserve the integrity of the grill. The heavy-gauge construction of the Weber S-470 withstands a vigorous cleaning with ease. The stainless steel grill won’t scratch even under a thorough scrubbing with a brass brush, which is recommended. Some say a putty knife is useful for getting hardened stuff out of the drip pan. In general, cleaning the S-470 is a matter of common sense and scouring everything that needs to be scoured. As we said, a lengthy session with the smoker feature may lead to the biggest clean-up challenges. It is highly recommended that the Summit S-470 be covered at all times when not in use. The reason is that some have reported that rain can cause water to collect in the same area where grease is collected, and can result is a rather difficult clean-up problem. But since this grill is a considerable investment in the $2,000 price range, keeping it covered is something most people will want to do. Weber sells a cover for this grill separately which you can view here. The Weber S-470 wields its very own proprietary “Snap-Jet” ignition system, meaning all you have to do is push a button or turn a knob to fire it up. You’ll never need matches. You also don’t need a plug in because the Snap Jet type ignition system runs on a small battery. It’s aptly named; at the turn of a knob, the flames “snap-to” on command! Perhaps more important is a temperature gauge, which many experienced cooks wouldn’t consider an extra, but a must for gaining maximum cooking control and outcomes. A true chef, for example, will tell you rack of lamb is best popped into an oven when it reaches 450, a brisket is best cooked “low and slow” at 200 to 230 degrees, and salmon finishes best at 350 (or broiled at 550). So a temperature gauge on the Weber S-470 gives you that extra level of control for fine cooking – you’ll never want to be without an accurate temperature gauge on an outdoor grill again! The temperature gauge is located on the front and in the center of the grill, making it super easy to monitor. Weber’s full-size gas grills come with enclosed carts with stainless steel doors, rather than just a front panel, for handy accessory storage. Weber designers also added a few features that are just plain thoughtful, such as handle lights, which make cooking after it gets dark outside much easier. The handle lights illuminate every time you open the grill hood making sure you can see your cooking creations clearly and comfortably. This might also be considered a safety feature. (Note: The handles themselves are chrome-plated cast aluminum). We’ll make mention of the various control knobs as well under the “thoughtful” category because they feature an innovative lighting design and give a smooth-action which are a pleasure under the hand. You’ll have no trouble seeing these lighted knobs in dark conditions. Last in the “thoughtful extras” category — six tool hooks, and yes, an excellent cookbook, and comprehensive user manual. 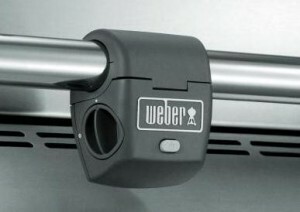 It is difficult to think of the Weber Summit S-470 as anything but an absolute home run. This is outdoor grilling at the very highest level. For gourmet cooks, this is a tool that will unleash and accommodate your most challenging and creative culinary demands. For those who just want sizzling, evenly cooked savory steaks, burgers, dogs or brats fast– and maybe some sweet cob corn on the side –the S-470 is an easy-to-use, no nonsense way to get a basic outdoor meal done quickly and with mouth-watering results.